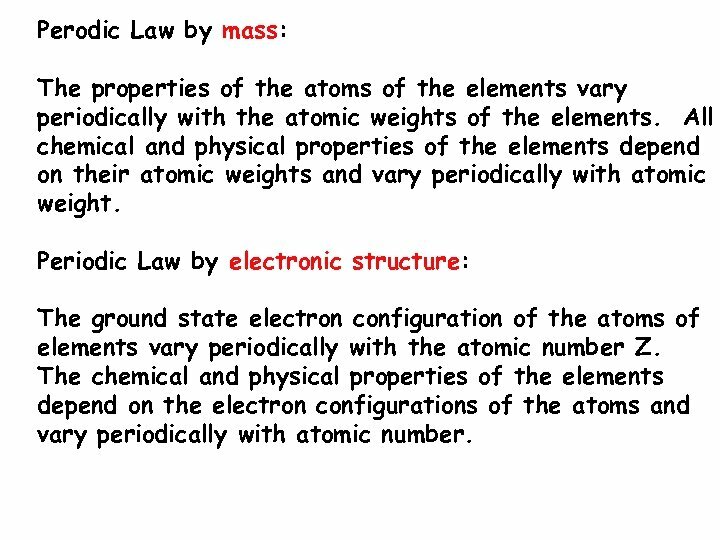 Perodic Law by mass: The properties of the atoms of the elements vary periodically with the atomic weights of the elements. 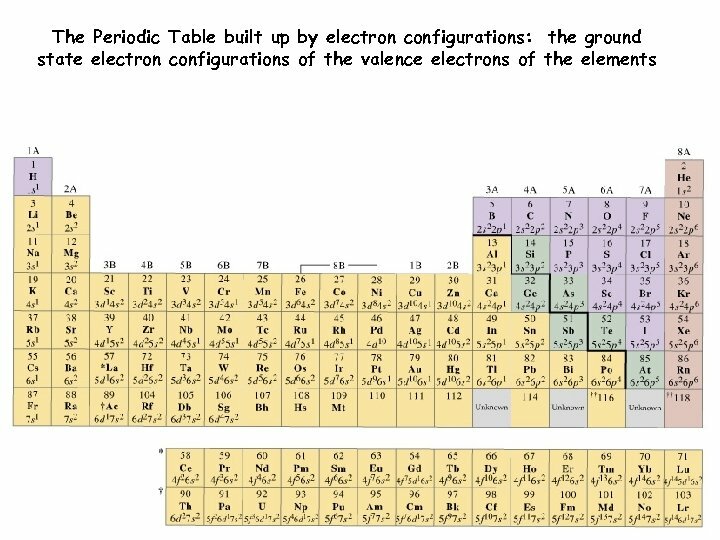 All chemical and physical properties of the elements depend on their atomic weights and vary periodically with atomic weight. 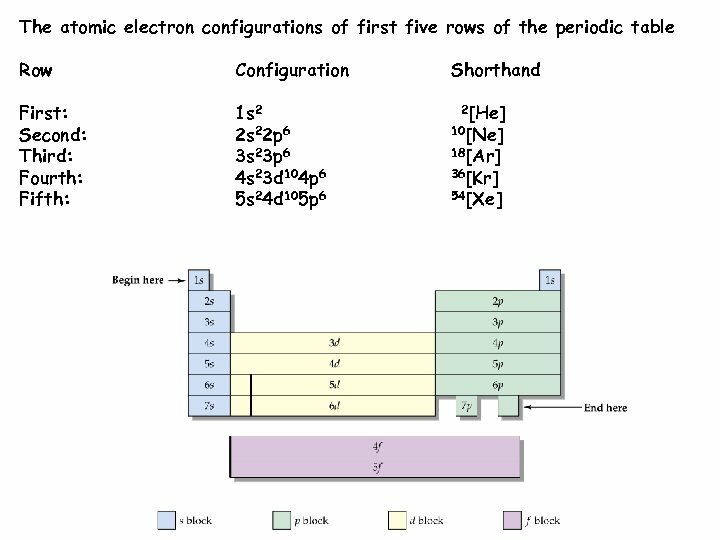 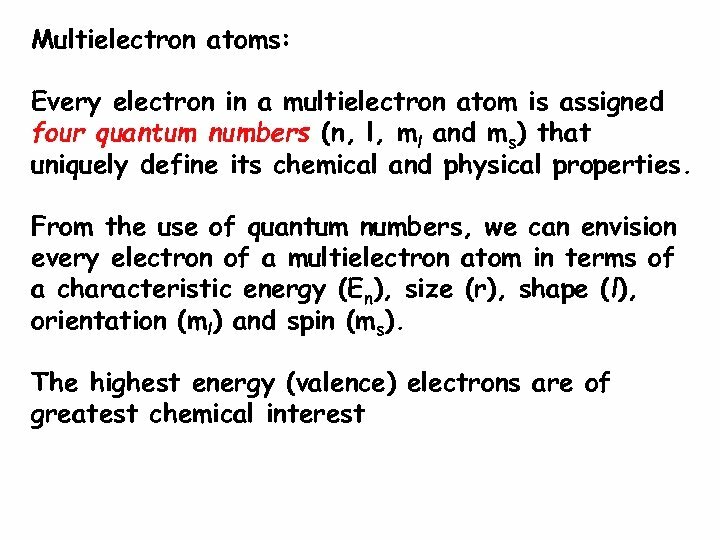 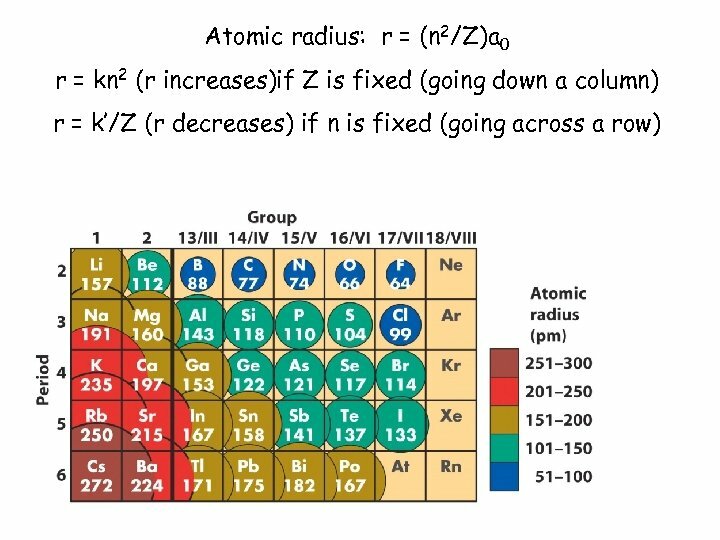 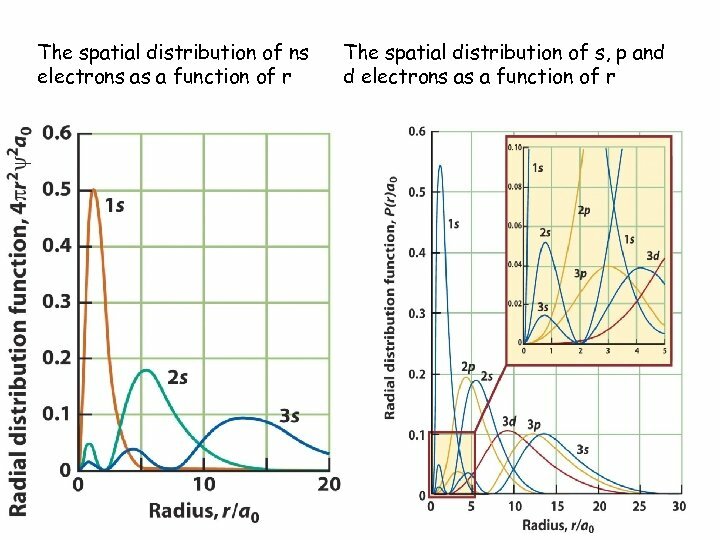 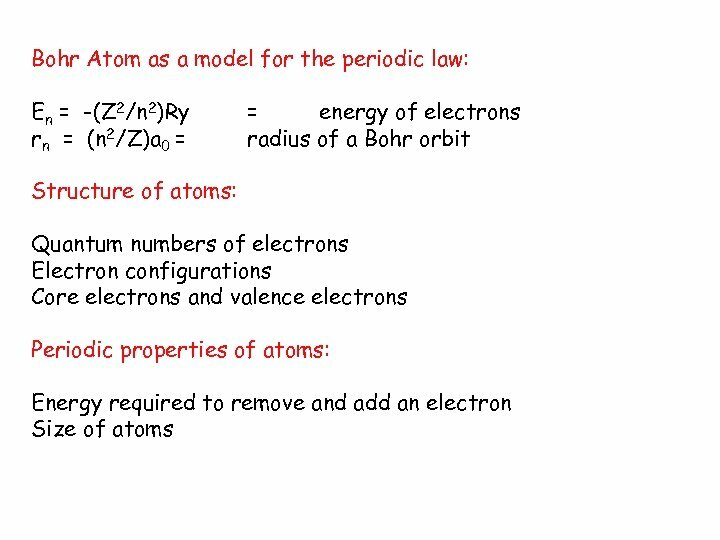 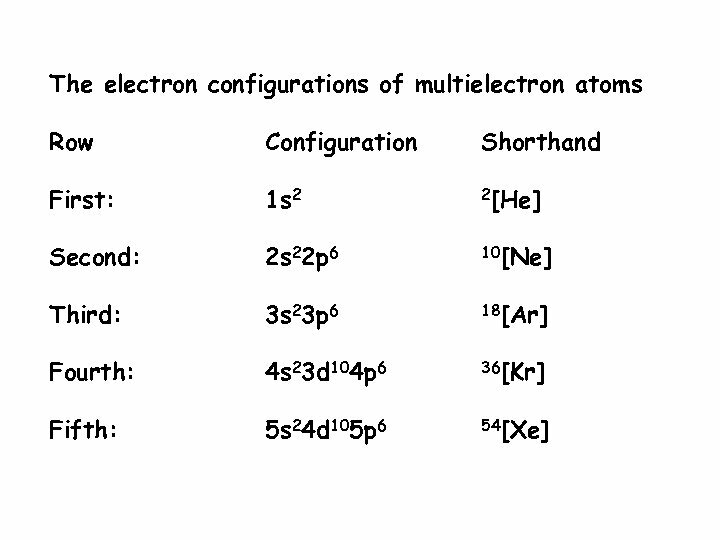 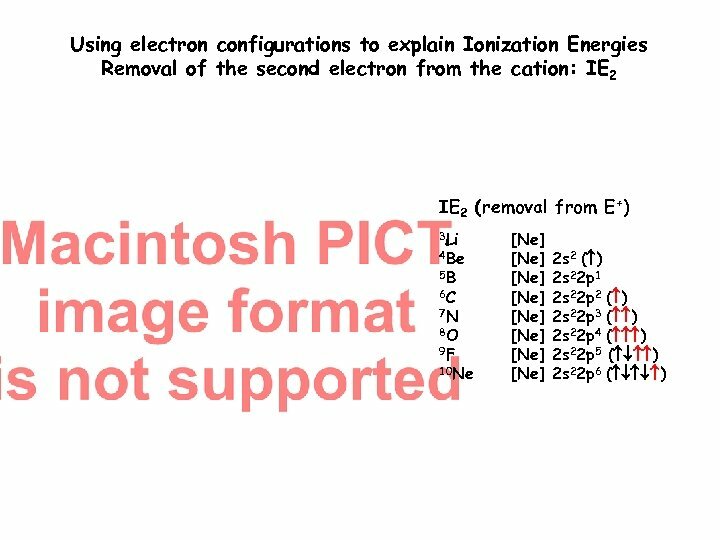 Periodic Law by electronic structure: The ground state electron configuration of the atoms of elements vary periodically with the atomic number Z. 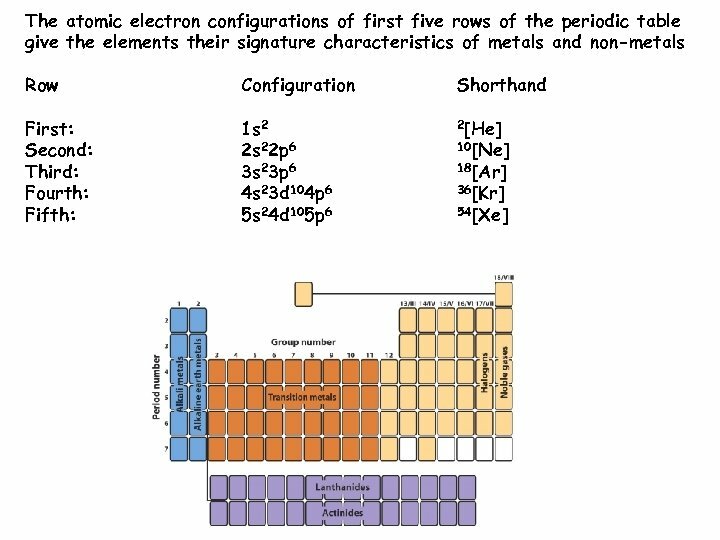 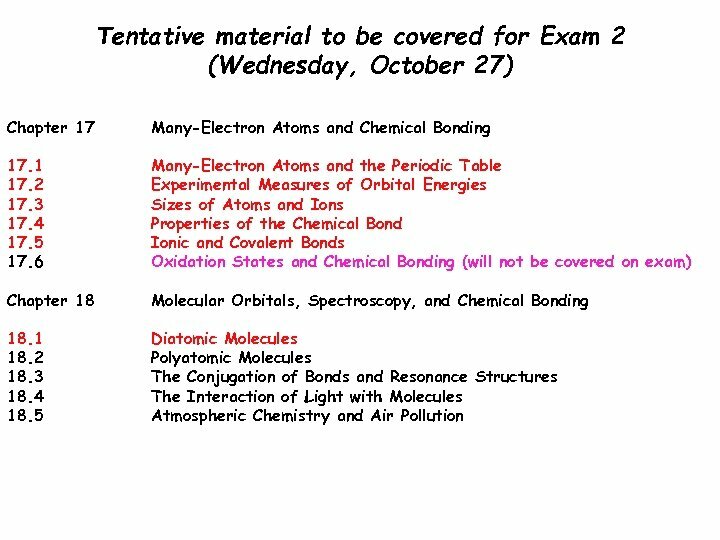 The chemical and physical properties of the elements depend on the electron configurations of the atoms and vary periodically with atomic number. 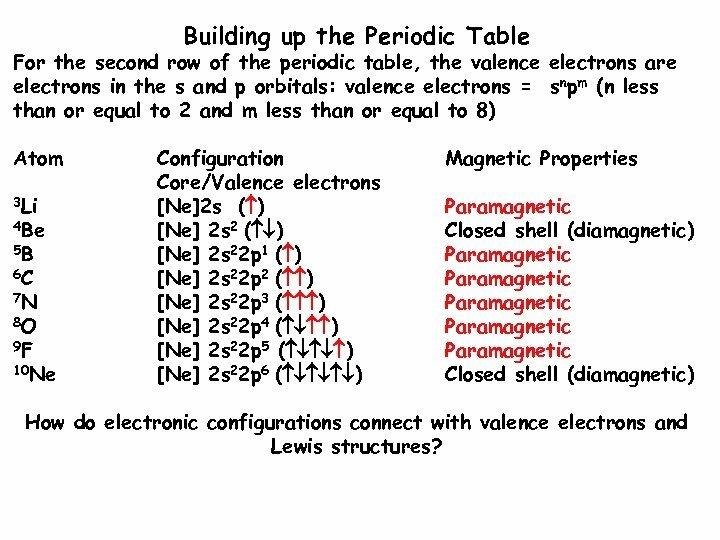 Building up the Periodic Table For the second row of the periodic table, the valence electrons are electrons in the s and p orbitals: valence electrons = snpm (n less than or equal to 2 and m less than or equal to 8) Atom 3 Li 4 Be 5 B 6 C 7 N 8 O 9 F 10 Ne Configuration Core/Valence electrons [Ne]2 s ( ) [Ne] 2 s 22 p 1 ( ) [Ne] 2 s 22 p 2 ( ) [Ne] 2 s 22 p 3 ( ) [Ne] 2 s 22 p 4 ( ) [Ne] 2 s 22 p 5 ( ) [Ne] 2 s 22 p 6 ( ) Magnetic Properties Paramagnetic Closed shell (diamagnetic) Paramagnetic Paramagnetic Closed shell (diamagnetic) How do electronic configurations connect with valence electrons and Lewis structures? 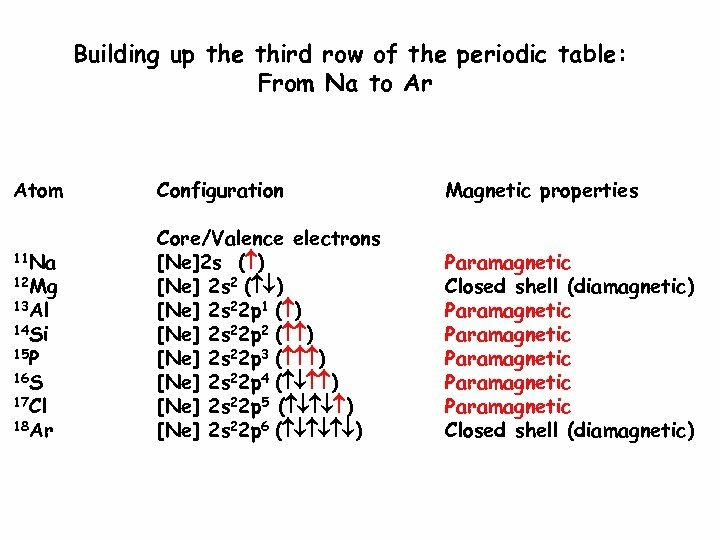 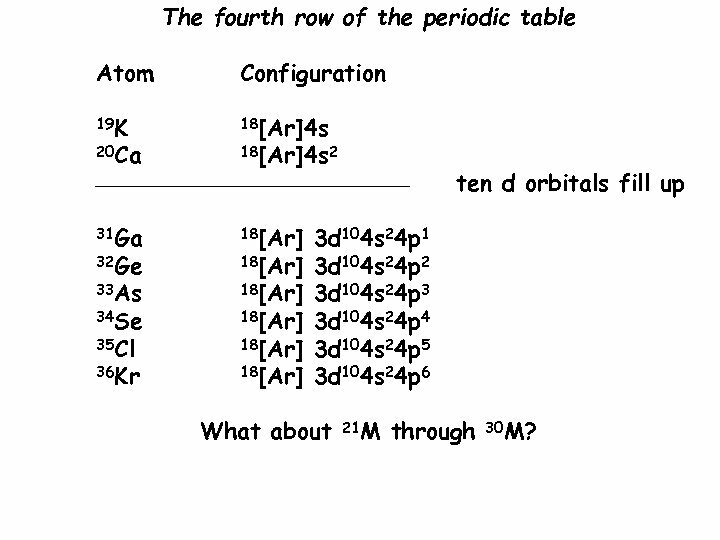 The fourth row of the periodic table Atom Configuration 19 K 18[Ar]4 s 20 Ca 18[Ar]4 s 2 _________________ 31 Ga 18[Ar] 33 As 18[Ar] 32 Ge 34 Se 35 Cl 36 Kr 18[Ar] ten d orbitals fill up 3 d 104 s 24 p 1 3 d 104 s 24 p 2 3 d 104 s 24 p 3 3 d 104 s 24 p 4 3 d 104 s 24 p 5 3 d 104 s 24 p 6 What about 21 M through 30 M? 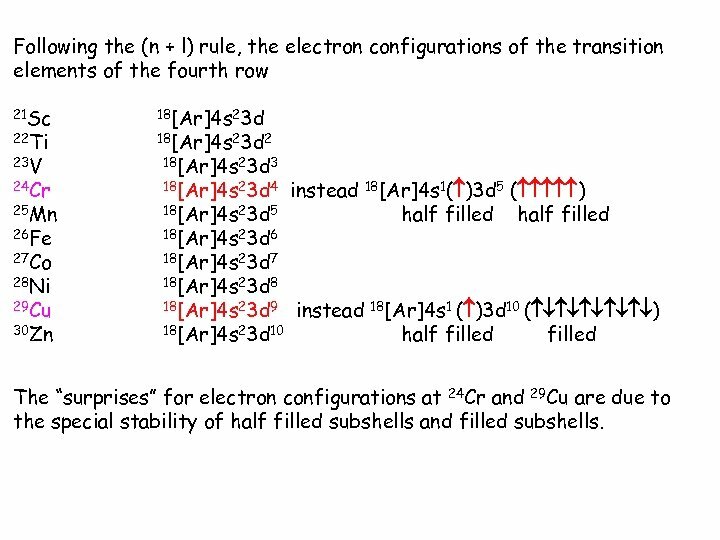 Following the (n + l) rule, the electron configurations of the transition elements of the fourth row 21 Sc 22 Ti 23 V 24 Cr 25 Mn 26 Fe 27 Co 28 Ni 29 Cu 30 Zn 18[Ar]4 s 23 d 2 18[Ar]4 s 23 d 3 18[Ar]4 s 23 d 4 18[Ar]4 s 23 d 5 instead 18[Ar]4 s 23 d 6 18[Ar]4 s 1( )3 d 5 ( ) half filled 18[Ar]4 s 23 d 7 18[Ar]4 s 23 d 8 18[Ar]4 s 23 d 9 18[Ar]4 s 23 d 10 instead 18[Ar]4 s 1 ( )3 d 10 ( ) half filled The “surprises” for electron configurations at 24 Cr and 29 Cu are due to the special stability of half filled subshells and filled subshells. 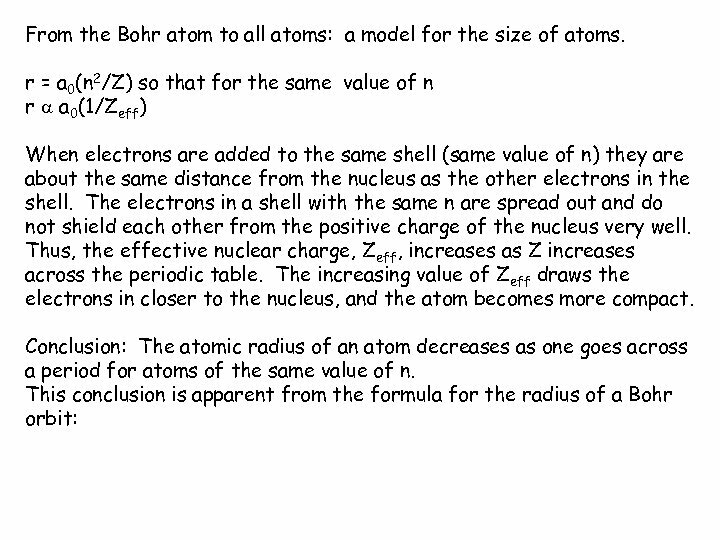 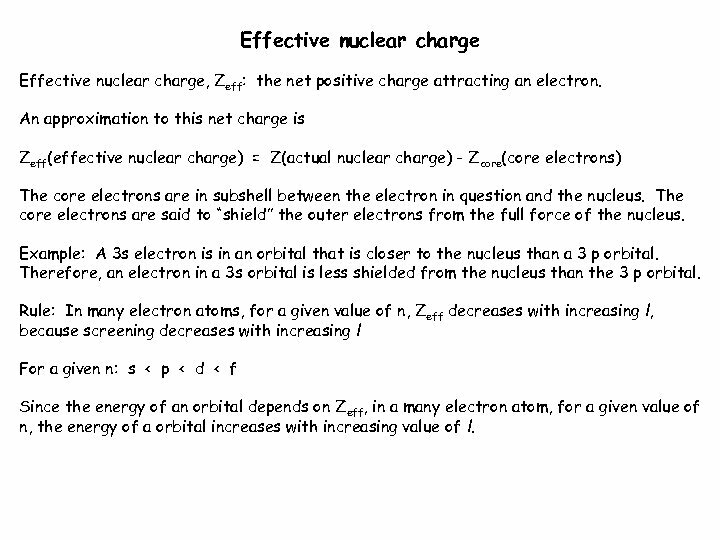 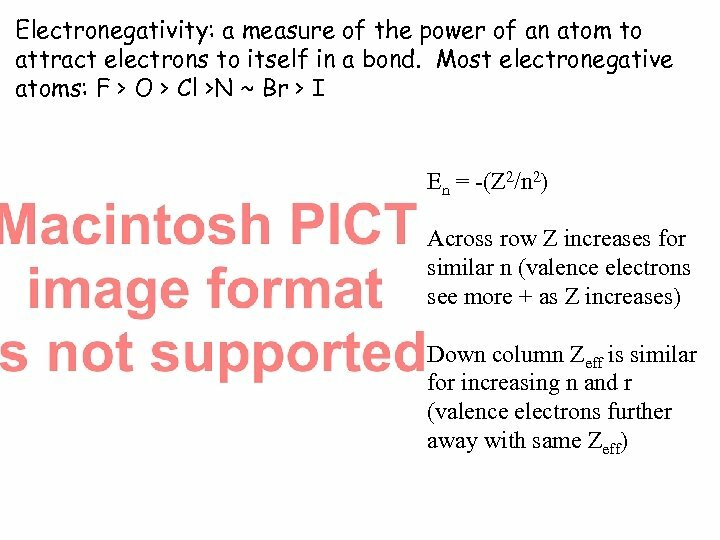 Effective nuclear charge, Zeff: the net positive charge attracting an electron. 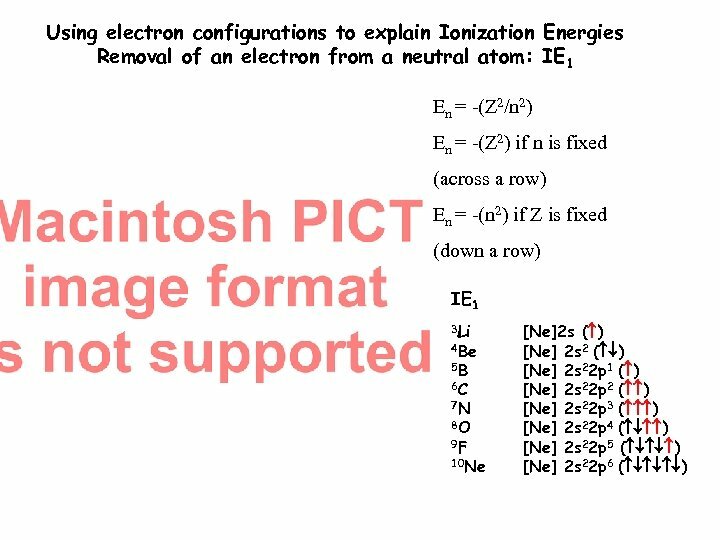 An approximation to this net charge is Zeff(effective nuclear charge) = Z(actual nuclear charge) - Zcore(core electrons) The core electrons are in subshell between the electron in question and the nucleus. 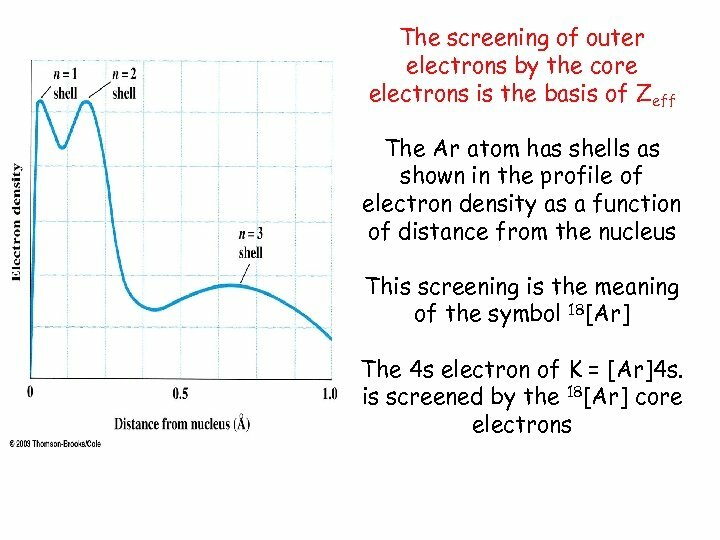 The core electrons are said to “shield” the outer electrons from the full force of the nucleus. 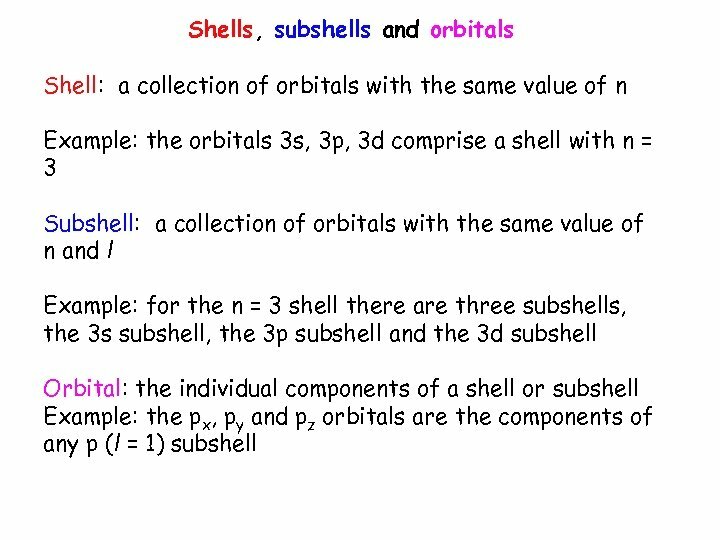 Example: A 3 s electron is in an orbital that is closer to the nucleus than a 3 p orbital. 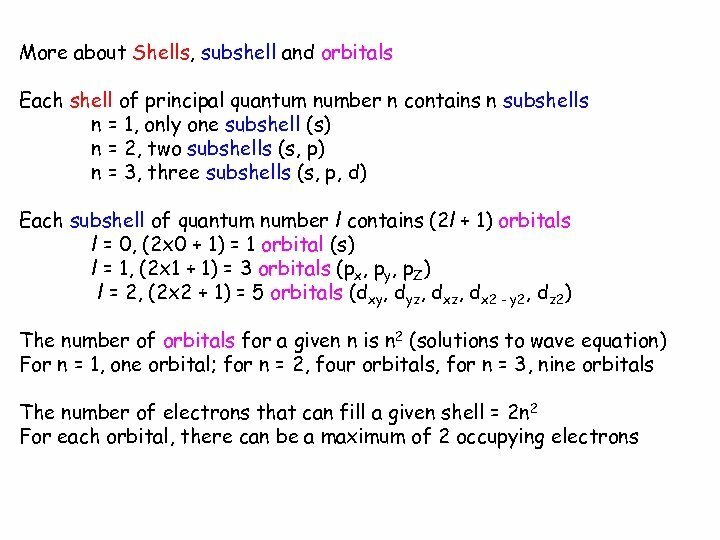 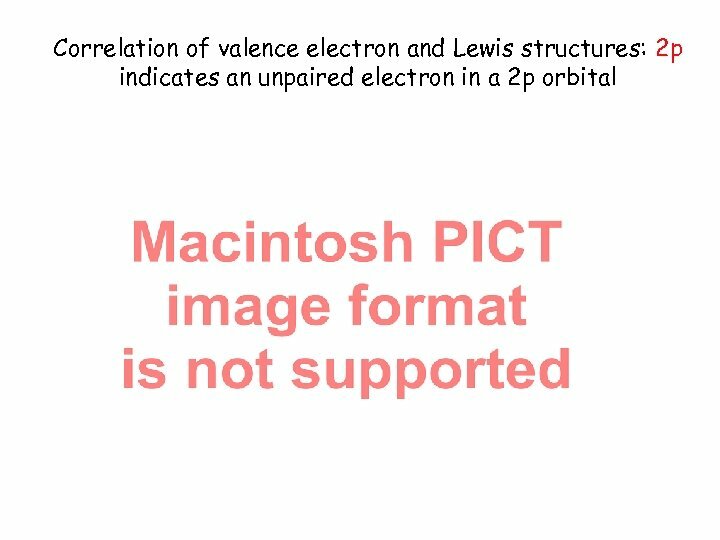 Therefore, an electron in a 3 s orbital is less shielded from the nucleus than the 3 p orbital. 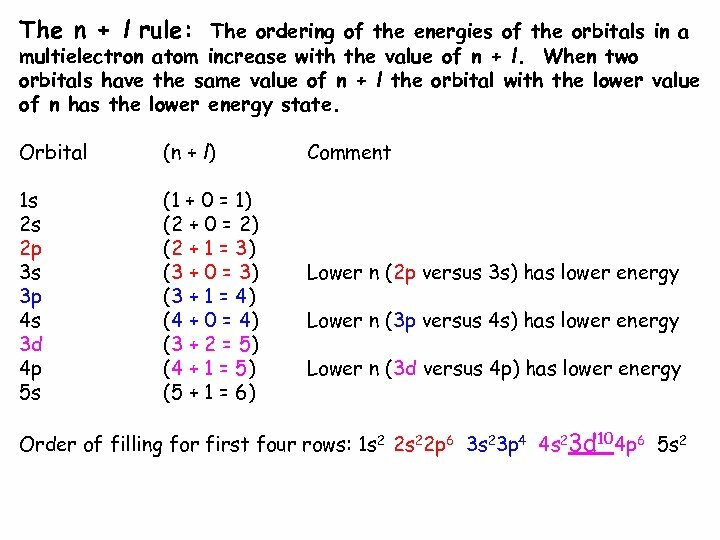 Rule: In many electron atoms, for a given value of n, Zeff decreases with increasing l, because screening decreases with increasing l For a given n: s < p < d < f Since the energy of an orbital depends on Zeff, in a many electron atom, for a given value of n, the energy of a orbital increases with increasing value of l.